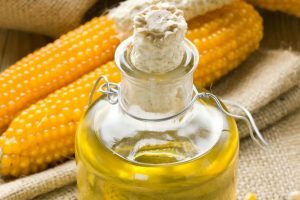 Corn oil is an exceptional oil. As one of few contains such high percentage of fatty acids omega-6 and omega-3. It is full of phytosterols, which contribute to right collagen synthesis in cells and calm all scalp irritations. Content of vitamin E in corn oil prevents hair loss and takes care of young appearance of hair, gloss and elasticity. It’s irreplaceable treatment for hair after summer season, when hair are subjected to sun radiation, which causes dryness to hair and scalp. Corn oil is not suitable for all hair types. Because of high concentration of EFA (essential fatty acids) omega-3 and omega-6 (mostly linoleic and oleic) this oil is not absorbing oil. This means that in most part it is build of large particles, which unfortunately are not being absorbed by the low porosity hair. It is because low porosity hair have closely adjacent cuticles, therefore corn oil cannot penetrate such hair and is being blocked. As a result hair are needlessly weighted down. However, high porosity hair will love corn oil. Such hair have raised cuticles, so their surface is a perfect place for large particles of corn oil. High porosity hair are usually damaged, dry, prone to split ends and breakage as well as matte, not very elastic, a bit rough in touch and deprived of the moisture. Beside deep regeneration, such hair need additional protection, thanks to which they will not be subjected to more damage. 1. Penetrates hair structures, provides them with regeneration and moisture from the inside out. It also strengthens hair bulbs to prevent hair loss. On top of that, corn oil takes care of scalp, cleanses it of toxins, prevents bacteria proliferation and eliminates dandruff. 2. Creates protective layer on the surface of the hair to protect them against additional damages. Hair gain protection both against mechanical damages (hot air, towel drying, elastic band, pulling) and the one caused by unfavourable atmospheric factors (freeze, wind, the Sun).